Why Do We Fall Ill Class 9 Notes are prepared by our panel of highly experienced teachers according to the latest NCERT Syllabus. These notes provide the students with the summary of the chapter, important points to remember and detailed explanation of important concepts and derivations for better understanding. Why Do We Fall ill Class 9 Notes aims at easing out your learning and revision process. Learn Why Do We Fall ill? The condition of body to function physically, socially and mentally well is called its health. A body with good physical and mental condition we call it a healthy body. It is not just a body free from disease or weakness but a state of thorough physical, mental and social well-being. A particular abnormal condition or function affecting the part or the entire organism is called a disease. A body infected with a disease is called a diseased body. 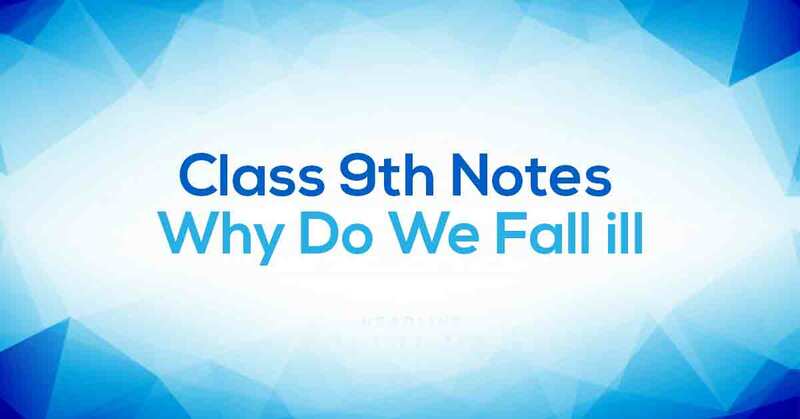 Learn more about the same in Why Do We Fall ill Class 9 Notes pdf.